One of my favourite places on the planet is bringing its talented artisans to Vancouver in March and I couldn’t be more excited. 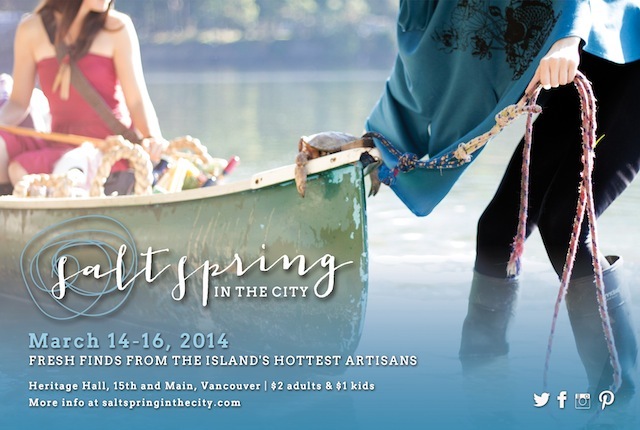 Salt Spring in the City will take place March 14th to March 16th at Heritage Hall on Main Street and will showcase the hottest artisans from this stunning island with over 30 unique brands to discover. From the modern to the rustic, chic to traditional — there will be something for everyone. Tickets $2 Adults $1 Kids. FREE for babes in arms. All admission proceeds will be donated to the Save on Meats Token program. Salt Spring’s artists’ creative talents are influenced and inspired by the island and for the first time we are coming together to bring that distinct flavour to Vancouver. Visitors to the show will have a unique opportunity to discover the best of what the island has to offer, as well as win an exciting array of prizes. Salt Spring in the City is more than just a market; it is an artist-run collaboration. We invite you to come and be a part of this dynamic and engaging show. It’s hard to put into words how John and I feel about Salt Spring Island but every time we visit, and I do a write-up about our adventures, I certainly try to express how this magical place makes us feel. The bucolic island bursts with natural inspiration, from sheep gathering in a pasture to twisted Arbutus trees clinging to cliffs along rocky shores. You can completely disconnect — spending all day curled up by a fireplace or hiking past fairy doors in the forest — or you can head into the village and try the latest cocktail creations and catch a game on the big screen while sipping a local brew. Artistic talent abounds and is celebrated everywhere you look. We are very lucky to have but a sampling of what this place has to offer, right here at the Salt Spring in the City event. A Quarrystone B&B on Salt Spring ultimate date night stay featuring one night’s accommodation for two in your preferred room type, a full four course gourmet country breakfast for two, a $75 gift certificate to The Oystercatcher Seafood Bar and Grill, a bottle of wine or champagne with hand-dipped chocolate strawberries, fresh flowers and candles for your room. I will draw one lucky winner at random from all entries at 12:00pm on Thursday, March 6, 2014. Follow Salt Spring in the City on Twitter, Facebook, Pinterest, and Instagram to learn more. Download the free Hello Salt Spring mobile app when you’re heading to the island as well. Must be 19+. Prize package does not include transportation to/from Salt Spring Island. Based on availability, some restrictions may apply. Update The winner is Jarrah! This does sound like a fabulous prize package! I’m looking forward to checking out Salt Spring Wool Arts, along with the rest of the artisans, at Heritage Hall. Fever Tree – would be fun to visit – love home decor stuff! Come out an see Anna Gustafson’s talented artisan work @ Salt Spring Island. Awesome contest! Let’s go with Saltspring Kitchen Co.! Monsoon Coast Trading Company – love their spices! Monster lab, i love salt spring! Odette Graham. I love SSI too!! Salt Spring Island Candie Co.
Island Soap Co – I would love to visit Salt Spring Island! Bees Wax Works. What an amazing prize pack!! Love exploring all the talented artisans and artists. Good luck everyone, but I’m really hoping I win. Need a retreat and l♥ve Salt Spring! Melinda Divers has captured some incredible images of the island environs. I’d like to see salt spring wool arts! Saw the website of Ulrieke Benner and loved everything! Never been to Salt Spring, just that alone would be great, let alone the whole prize! That would be oh-so-awesome! Erin Morris pottery – I bought one of her bowls last summer and still haven’t decided which lucky person I will give it to! Bee Wax Works!! Thanks a bunch! I’d love to win, I’ve never been! Erin Morris Ceramics. Lovely stuff. Mount Maxwell Coffee Roasters!! Can never go wrong with finding new yummy coffee!! I love visiting Salt Spring Island. I agree with you, there is something magical about the island. Odette Graham. Never been to Salt Spring and would love this opportunity to go. Island Soap Co! Tami is the best. Bees Wax Works. This prize sounds lovely! I love going to the farm when the lavender is in bloom! I love my spices from Monsoon Coast Trading Co. Look forward to stocking up. Sacred Mountain Lavender. Thanks for putting on this amazing giveaway. Looking forward to event. Blue Horse Gallery sculpture sounds awesome. Organic Gaia Foods! Awesome giveaway!!!! What a dream prize. Would love to win this treat! Salt Spring Wooden Toys. I’d love to win this prize and take my husband away for an amazing weekend on Salt Spring Island! Monsoon Coast Trading Co…would love to check out Salt Spring Island! What a prize pack! Erin Morris Ceramics. Thrive Lifestyle! Wonderfully curated store and charming owners. What an awesome prize! Monster Lab!!! Salt Spring Tourism! I would LOVE to visit this fantastic island! Monster Lab – love their stuffies! I really like the shampoo from Sacred Mountain Lavender. Saltspring Kitchen Co! Woot Woot! I love Cherry Blossom Clothing ! Put me in the draw and good luck to me!!! Great contest! I visited Salt Spring when I first moved to Vancouver, and it was such a relaxing experience! Monsoon Coast Trading by Andrea LeBorgne (a Wee Rock Member)! I’m so excited to get more soap from island soap co from this. Thanks for the info! Bees wax works! This is just fantastic! Oooh Mount Maxwell Coffee Roasters! Love my ring from Hawk & Owl….looking forward to see what he’s bringing to Heritage Hall. a) Totally need this in my life! Elf Leatherworks. Looking forward to this so much! Bee wax works! Love salt spring island ! Bees Wax Works; great products! Believe it or not, but the only island we haven’t been too yet! looks like a beautiful getaway! Lovely contest. Amazing island. I’m looking forward to checking out the Island Soap Co. Love any bath and body products naturally sourced and made! Sacred Mountain Lavender. Lavender is sooooo soothing. Bees wax works. Thanks for the awesome contest! Erin Morris has some beautiful ceramics. Hope you pick me! Cherry Blossom 🙂 I love my dress from them! Ooooh you have no idea how much this would mean at this time……..Thanks so much for providing such an awesome experience in such an amazing place. Oh an salt spring island candle co……. I love Monster Lab’s little creations! Fever Tree is one of the artisans! 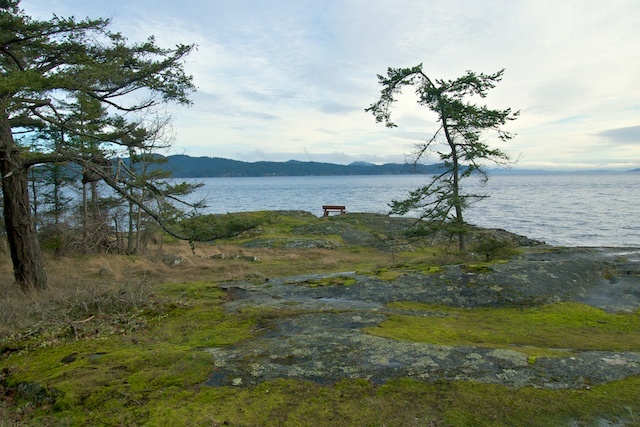 Salt Spring is such an amazing getaway, I’d love to win! Island Soap Co. and the make great products! Salt Spring Kitchen Co. This would be a great retirement treat for my husband. Thank you for the opportunity. I enjoy morning coffee out of one of her fantastic wonky mugs each day. Bees Wax Works. This would be a honey of a prize!! SaltSpring Wool Arts!!! Oh yeah! Looking forward to checking out Hawk and Owl Jewellery! Two Monkeys Design. Would love to win. Good luck everyone. Beautiful place and would love to get to know it better!